This post content courtesy of a press release from Artist Ave Station. Artist Ave Station announces its official ribbon-cutting ceremony on Friday, May 6, 3:00pm at its location at 800 N. Tatnall Street in downtown Wilmington. 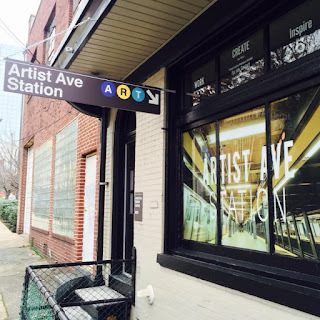 Artist Ave Station opened its doors on December 31, 2015 and has since served the Creative District community as a hub for artists, creatives and entrepreneurs to simultaneously live, work and create. Artist Ave offers its members luxury loft-style apartments with awesome aesthetics, a high-design shared workspace and a functional creative space to get down and dirty. Tours will be available for the newly renovated third-floor studio loft apartment, which has been gutted and custom remodeled. During the ribbon-cutting ceremony, the space will showcase works by local artist and advocate Michael Kalmbach and his team from the Creative Vision Factory – an organization that provides individuals with behavioral health disorders an opportunity for self-expression, empowerment and recovery through the arts. The Creative Vision Factory members will display a mosaic tile project they've created in collaboration with Artist Ave Station. This event will also feature the launch of Artist Ave Station member Llennef Clothing's new spring/summer collection. Artist Ave Station is a purpose-built environment that specializes in providing artists, creatives and entrepreneurs with a variety of areas to focus, collaborate, lead and/or socialize. The organization offers members use of space as a gallery or pop-up shop to exhibit work and host events.